Actually, I wanted to blog this in German, but then I remembered a request some time ago from fellow blogger DQ, who asked about “a post on what Germany is like”. Well, Germany is just as diverse as any other country, and there’s a lot to blog from here, just as there’s a lot to blog from remote villages in Kenya. I am often tempted to write in German, but then I read a quote from a page yesterday, where they listed a few popular German bloggers – and guess what? Looks like there are only a few Germans out there who blog in English. Whatever. No matter what language, things like “election campaigns” are just as dumb in Germany as they are in Kenya. Whereas politicians in Kenya are meanwhile busy talking about proper leadership (as if problems could be solved by better leaders only), a similar stupidity applies to Germany, where – on a very local level – we’ll have elections on May 13th 2007 in the City and Federal State of Bremen. This young DVU candidate, who is about my age, sent out letters where he asked for votes. Well, that’s normal practise. 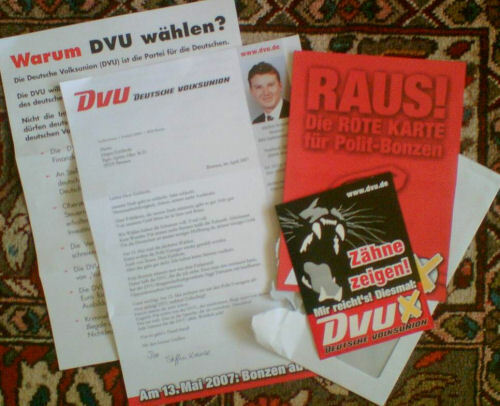 EVEN the mission statements on the attached flyer aren’t as bad as one could assume – with the DVU being a very nationalistic, far right party – I never expected anything else but nationalistic issues such as that Germany has in the past contributed “too much” to the European Union or that the impoverishment of Germans should be reduced and so on. They indeed claim to be the German People’s Union, which is why they came up with nationalistic subjects which may be understood by the common people. Or in other words: just as smart Kenyans don’t give a damn if Raila Odinga keeps on driving around in a Hummer or a Jaguar, smart Germans don’t give a damn about such issues the DVU made a subject of their discussions. Why? Because all these issues may indeed have an interesting core, but are completely out of this world. Because the attached letter is so blatantly stupid that you instantly question the social maturity of the DVU candidates. And Siggi, the DVU candidate who made it to the parliament in Bremen during the last elections, is just a living proof for…..well, let’s say: God’s humour. THESE GUYS, however, aren’t just funny, but also interested in manipulating those one that still can’t seperate good and evil. They actually went to some schools in the City and distributed DVDs with German music. Nothing wrong about that – but what would you think if a politician comes to the school of your children and tries to influence them? See? There are indeed a lot of things that need to change in Bremen, Germany and Europe. However, I really doubt that the DVU will be part of the solution process. And for those who are still undecided and who are allowed to vote – there’s this Wahl-O-Mat thing on the internet – a small applet that lists about 30 theses from political parties. Now even if you don’t speak German, pls have a look at it. This thing could be a perfect gadget for the election campaign in Kenya – maybe via SMS? All it does is listing all these theses, and then you can click or vote for what you think is best. In the end it shows you what you voted for – and what the political parties are campaigning for. Makes sense whenever the electorate is interested in real issues, and when things are not only about identifying “good leaders”. I sincerely doubt that the Kenyan electorate is in any way seriously interested in “issues”, that is in substantially diverging political standpoints on material questions. What Kenyans care about (apart from gossip), are persons and tribal affiliations. And power for power’s sake. That might change eventually, but I am pessimistic that we have achieved such maturity already. The buzzword is liidaah-sheep. Note my Kenyan spelling, as befits the meaning.